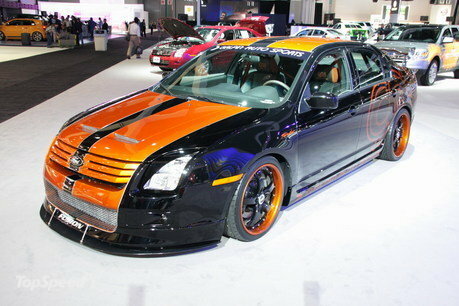 This 2007 Ford Fusion is ready for the racetrack courtesy of Galpin Auto Sports. The turbocharged V-6 pump out 350 horsepower driving all four wheels. Gears are selected via a six-speed paddle-shift transmission. An APR Performance carbon front splitter and rear wing and 3D Carbon body kit provide the necessary aerodynamics while the MRT lightweight functional ram-air hood feeds the motor.